A beautiful white sparkling bursting with grapefruit, lemon zest and spring blossoms. The palate of our Lot 74 Niagara Sparkling Brut is fresh with lime-dominated citrus, mineral and fresh-cut pineapple. The mouthfeel is soft and creamy, light and dreamy. Fantastic for those upcoming special occasions, like Wednesday, right? Fantastic in an Icewine mimosa! * Taxes are included in both wine and shipping costs. PondView is pleased to announce the Grand Opening of our NEW Cheese Shop. We have partnered with some of Canada's best artisan cheese producers to bring you an assortment of delicious artisan cheeses. "Blockbuster" 2016 Cab Merlot Reserve (W,O) paired with steak spice grilled beef patty, crispy onions, smoked 5 Brothers cheese, BBQ Aioli on a Brioche bun. Experience our spectacular current and limited edition Bella Terra Reserve Cabernet's from our 30+ year old vines. 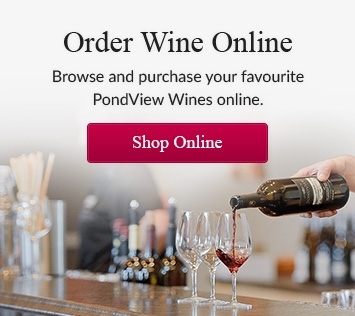 Learn about the Pondview Story and our unique location in the Heart of Four Mile Creek sub-appellation. Enjoy a guided tasting of these sought after wines paired with our Chef's famous charcuterie board.